Oh Barefoot Contessa, how I love you and basically everything you have ever made! 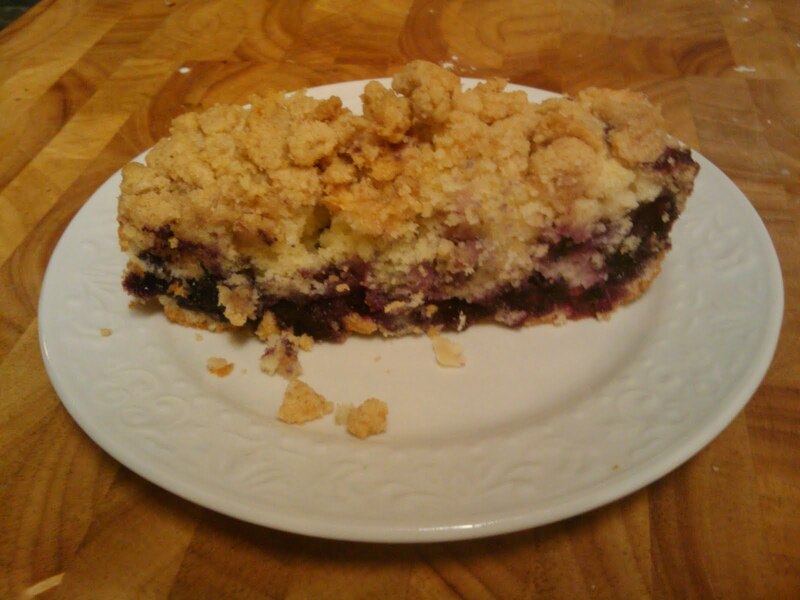 A friend of mine brought me some fresh blue berries from South Georgia and I used them to make Ina Garten’s Blueberry Crumb Cake. I scaled down the original recipe and made it in a loaf pan instead of the 9 inch round she called for, and besides the fact that almost the whole thing was gone that night it was perfect! Preheat the oven to 350 degrees and butter and flour a loaf pan. Cream the butter and sugar in the bowl of an electric mixer or in a medium bowl with a hand mixer, on high speed for 4 to 5 minutes. Reduce the speed to low and add the eggs 1 at a time, then add the vanilla, and sour cream. In a separate bowl, sift together the flour, baking powder, baking soda, and salt. With the mixer on low speed, add the flour mixture to the batter until just combined. Fold in the blueberries and stir with a spatula to be sure the batter is completely mixed. 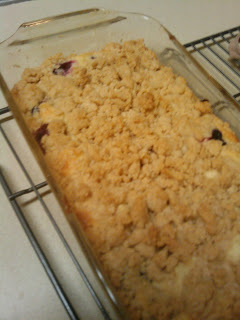 crumble the topping evenly over the batter. Bake for 35 to 45 minutes, until a cake tester comes out clean. She says to let it cool completely, but I have no self control so I ate a piece almost immediately. I thought it was best warm, right out of the oven...hence it was basically all gone that night…but the last remaining slice for breakfast with coffee the next morning was also delicious!